Beautiful Bellaire TX is known as the “City of Homes” for its gorgeous residential properties. We create stained glass designs that match our clients’ tastes, décor, architecture, or imaginations! In Bellaire TX, decorating a home down to the last individual detail is part of the city’s culture. Many Bellaire homeowners are looking for stunning décor, and some are looking for more privacy at the same time. With our custom designed stained glass windows and doors, Bellaire homeowners can have the privacy they are looking for while still letting in the light. And adding style, uniqueness, texture, and elegance to any room of a home. When you work with us, every aspect of your new stained glass will be custom designed to your specifications. Each and every piece of stained glass we do is hand crafted by our specially trained and incredibly talented artisans. The result is stained glass that is perfect for YOU: the highest quality, the most beauty, and the designs that you will love and appreciate for decades to come. The first step in our design process takes place in the comfort of your Bellaire Texas home. One of our design professionals comes right to your home to discuss styles and ideas, show you photos and samples, and create sketches until your perfect design is found. The next steps happen back in our Houston studio. We will take the sketch and turn it into a blueprint for exact fit in your windows using modern CAD software. We will order all the necessary glass and other materials. And we will assign the project to one of our stained glass builders, who will cut each piece of glass by hand. Assemble the window and polish it by hand. Last, but hardly least, is the final installation into your Bellaire home by one of our experienced installers. All stained glass is protected from the elements by installing it to the inside of an existing window pane. This ensures it will last a very long time without damage. 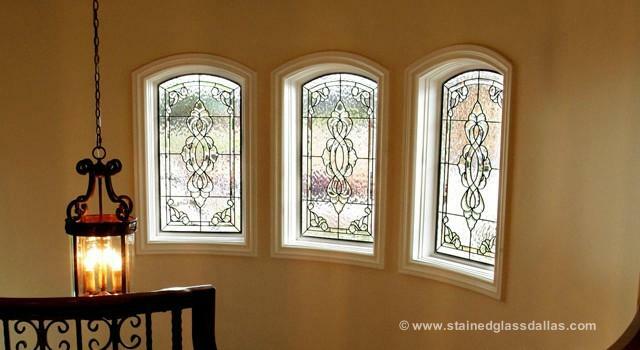 Many of our residential clients love colorless leaded and beveled stained glass in their homes. This style catches the light in delightful ways, it looks elegant and timeless, and it matches any color scheme. Clients cannot believe how gorgeous their new custom designed stained glass looks in their homes; it exceeds their imagination. With a great central location within the Houston-The Woodlands-Sugar Land Metropolitan area, Bellaire homes have convenient access to main roads and freeways. Bellaire boasts tree-lined streets and lovely tranquil parks. It has such award-winning schools such as Bellaire High, a top performing Texas high school and Pin Oak Middle School, which is a National Blue Ribbon School.